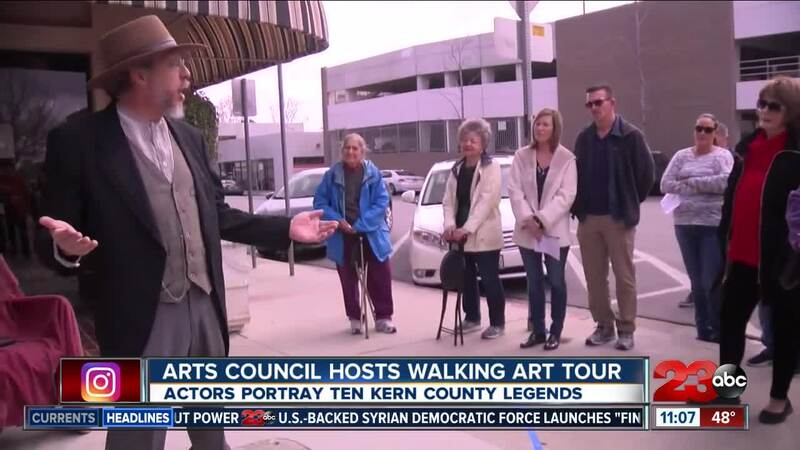 Arts tour resurrects Bakersfield heroes for walking art tour. BAKERSFIELD, CALIF. — From musicians to civil rights leaders, Kern County has produced many memorable and colorful people. On Saturday, Bakersfield history came to life during the “ Stories on the Sidewalk ” walking tour. “Downtown is thriving, the arts are thriving, they are educational and for everybody,” said David Gordon, the Executive Director of the Arts Council of Kern. The walking tour featured local actors portraying famous Kern County legends and performing monologues written by local writers. “It’s a collaboration between Kern County writers and Kern County actors.” said Gordon. Attendees are able to travel through time as they walk to different locations in downtown, meeting famed residents along the way. “They just come upon Kernel Baker or Earl Warren or Pancho Villa and they act out some significant part about Kern County,” said Gordon. Attendees said it inspired them to discover more about Kern County. Gordon said the art council hopes the event will show how much art is truly available in the region, showing that history is all around us.